Mike always walks the dog in the evening while Elizabeth relaxes in the bathtub–but one night he doesn’t come back. Mike has drowned while saving a teenage girl named Kate, his dog standing on the bank barking frantically as the police pull his body from the water. But despite her husband being lauded as a hero, Elizabeth can’t wrap her mind around the fact that Mike is gone–and Kate won’t reveal the details of what really happened that night. Elizabeth has never been to a funeral home before. She and Patricia enter the building together and then take turns going into the room. Patricia goes first and comes out swollen-faced and silent, nodding and clasping Elizabeth’s hands. So, still unsure, she rises and faces the oak-effect door. It’s a smaller room than she thinks it will be. The light is low, and the smell of flowers, from a complex arrangement in which some of the smaller blooms are dying, is a mixture of sweetness and must. There’s a cross. And there’s a seat, next to the coffin. Because there’s a coffin. There’s a coffin. Elizabeth closes her eyes and tries to make herself breathe. She looks again. Yes, there’s a coffin. Mike’s coffin. Her soul winces. The top part is open, the rest closed. Experimentally, Elizabeth puts her hand on the wood near the bottom, where she would imagine Mike’s feet to be, were she able to think about his cold, dead feet in a box. She checks her heart and feels nothing new, nothing worse. She takes a step farther up. Her hand is where his knees would be. The wood is smooth. Her palm runs up thigh, over stomach, rests on chest, in a horrible pantomime of what she’s done so often in life. Her mind is saying, Well, if Mike was gone, this is how it would be, yes, but he can’t be gone. He can’t be. Elizabeth knows what needs to come next. So she takes another step, and she looks down. Mike’s face is swollen, only slightly, and an odd color, although that might be the light. Blake had driven them the short distance, neither of them ready for the walk, or the people, or the light of an ordinary day. He had told them in the car that Mike would look as though he was sleeping, but this face, solemn and enclosed, bears no resemblance to her sprawling, duvet-hogging, snoring husband, liable at any moment to throw out an arm and pull her in to him, even though he was fast asleep. Elizabeth realizes she is holding her breath as she fights to recognize what’s in front of her. Cautious, she reaches out her left hand, her own skin dull in this dull light. She touches his face. Her thumb strokes the indentation to the left of his right cheekbone. He is cold, and his skin is powdery, and she watches, waiting for him to open his eyes. Tears fall from hers and gather on his face, and she wipes them away gently with the thumb that wears his wedding ring, and just for a moment these are his tears, and they are crying together. She whispers, “I want to hold your hand.” Her own hands, free to rake through her hair and twist around each other and catch at tears falling from her chin, tingle at the horrible thought of being contained in the way his are. She whispers, “Show me that you haven’t gone,” and she sits, and she waits, her hand on the coffin where she thinks Michael’s hand must be. She closes her eyes. “You promised you would never leave me,” she says, trying a different tack, thinking a prod might work where a plea has failed. Time stops, and the world stops, and even the tears stop for a while, as Elizabeth strains for a sign, all of her senses ready and oh so willing. But no sign comes. Stephanie lives in Northumberland, England, and talks and trains in thinking skills all over Europe, most recently in Kazakhstan. She has written two books on her experience with cancer, and she is an active blogger and fundraiser. 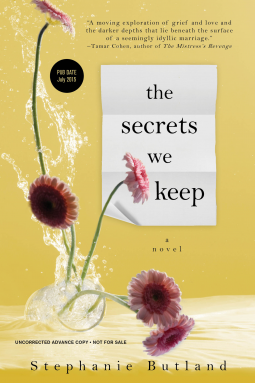 The Secrets We Keep is her first novel.